Worldwide fossil fuel use could end as early as 2050. By then renewable energy could entirely power the countries that today account for more than 99% of all energy use, according to a new study. 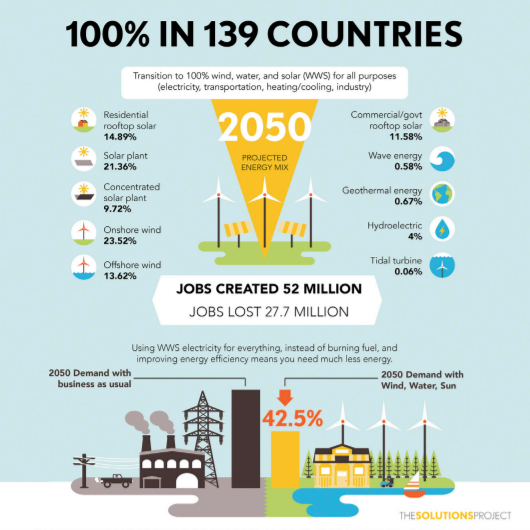 Researchers at Stanford University and other US and European universities have plotted out roadmaps for 139 nations to transition to 100% renewables by 2050. While the individual power mixes of each country vary, the vast majority (94.7%) of all energy demand is predicted to be met by established wind and solar power technologies. However, the study, which is part of an ongoing campaign for 100% renewables launched by actors Leonardo DiCaprio and Mark Ruffalo in New York in 2015, also allows for use of some less developed technologies such as tidal and wave energy. The study, by the Solutions Project, aims to completely remove reliance on fossil fuels by switching all energy use to renewable sources. It claims doing so would deliver the Paris Climate Change Agreement target of keeping global warming to below 1.5C. It could also help avert the 4.6 million deaths that are connected to air pollution each year. By targeting renewables use across all energy demand, rather than just electricity, the study sets the ambitious goal of switching all heating to ground source and air source heat pumps. It also requires all vehicles to be electric, and aircraft to be fuelled by hydrogen. To reach 100% renewable energy use also means dropping not only fossil fuels, but nuclear power too – as this requires uranium to be mined. 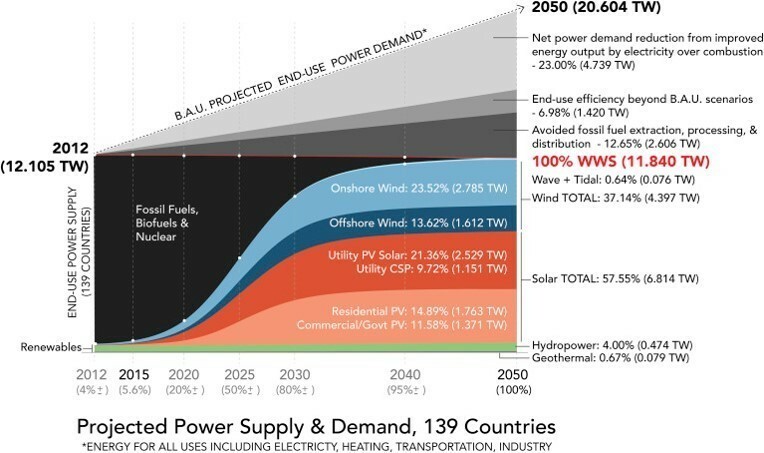 If this happened, global energy demand could be cut by more than a tenth (12.65%). Similarly, switching large amounts of energy use from combustion engines to electricity could cut energy use by nearly a quarter, due to electricity’s greater efficiency: for example, in an electric car 80% of the energy is used to move the car, and the remainder is waste heat; in a petrol car this is reversed, with only 17-20% of the energy from the fuel used to move the car. Aside from the obvious challenge of having to develop as yet unproven technology such as hydrogen fuel cells for aircraft, reaching 100% renewable energy requires some other major hurdles to be overcome. Firstly, while countries such as Albania, Costa Rica, Iceland and Paraguay all run on 100% renewable electricity, none run on 100% renewable energy. According to the Solutions Project study, published in the journal Joule, the countries closest to 100% renewable energy are: Tajikistan (76%), Paraguay (58.9%), Norway (35.8%), Sweden (20.7%), Costa Rica (19.1%), Switzerland (19%), Georgia (18.7%), Montenegro (18.4%), and Iceland (17.3%). 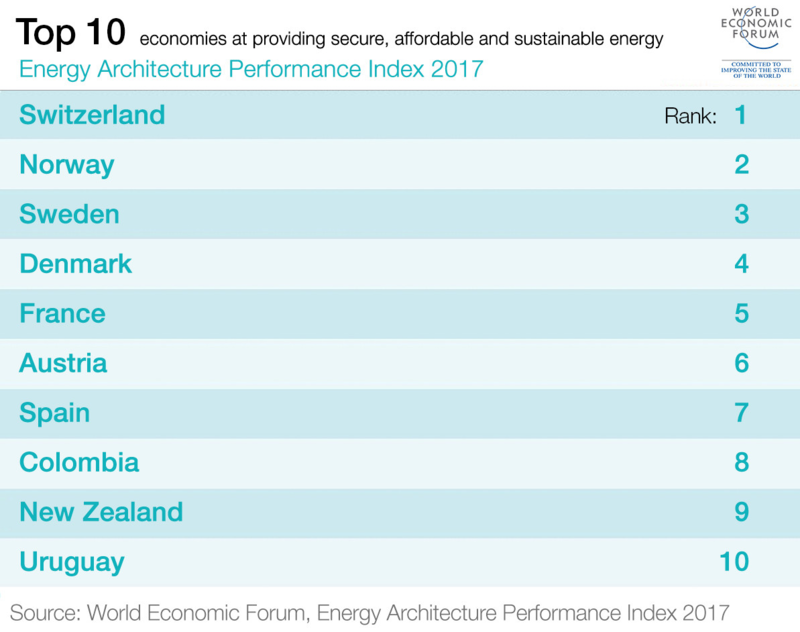 Four of these nations feature in the World Economic Forum’s Top 10 rankings of the world’s best energy performers. Notably absent, however, are the world’s two largest economies, which are also the world’s two largest renewable electricity markets: the US and China. This indicates the scale of the challenge, with the study concluding that today just 4.26% of the capacity required to reach 100% renewable energy in 2050 currently exists. Secondly – and perhaps even more challenging in terms of potential opposition to 100% renewable energy – the switch to this system in 139 countries would result in 27 million job losses across industries such as oil and gas and nuclear energy. However, the study claims this would be offset by 52 million jobs created in renewable energy generation and transmission – a net increase of 24.3 million new jobs.